Today we're going to take a look at the Visitor pattern. Of all of the patterns that I've used so far, Visitor is by far the most powerful and convenient. It's a difficult pattern to explain in the real world, but things should become clearer as we go through the pattern definition, and take a look at how to use it in code. The core of this pattern is the Visitor interface. This interface defines a visit operation for each type of ConcreteElement in the object structure. Meanwhile, the ConcreteVisitor implements the operations defined in the Visitor interface. The concrete visitor will store local state, typically as it traverses the set of elements. 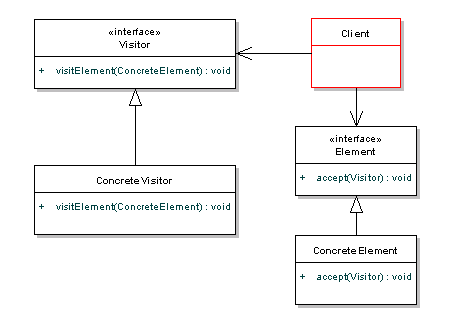 The element interface simply defines an accept method to allow the visitor to run some action over that element - the ConcreteElement will implement this accept method. In summary, if you want to decouple some logical code from the elements that you're using as input, visitor is probably the best pattern for the job. The following example shows a simple implementation of the pattern in Java. The example we'll use here is a postage system. Our set of elements will be the items in our shopping cart. Postage will be determined using the type and the weight of each item, and of course depending on where the item is being shipped to. Let's create a seperate visitor for each postal region. This way, we can seperate the logic of calculating the total postage cost from the items themselves. This means that our individual elements don't need to know anything about the postal cost policy, and therefore, are nicely decoupled from that logic. Now, we'll create a concrete implementation of our interface, a Book. As you can see it's just a simple POJO, with the extra accept method added to allow the visitor access to the element. We could add in other types here to handle other items such as CDs, DVDs or games. As you can see it's a simple formula, but the point is that all the calculation for book postage is done in one central place. So, while the Visitor may seem a bit strange at first, you can see how much it helps to clean up your code. That's the whole point of this pattern - to allow you seperate out certain logic from the elements themselves, keeping your data classes simple. Also, it can be difficult to refactor the Visitor pattern into code that wasn't already designed with the pattern in mind. And, when you do add your Visitor code, it can look obscure. The Visitor is powerful, but you should make sure to use it only when necessary. Later on this week, we're going to visit the Proxy pattern.